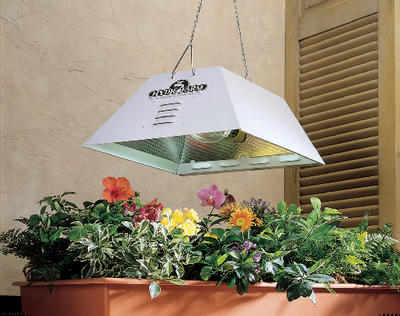 This high-efficiency grow light easily suspends from ceilings and provides light in the optimal growing spectrum from a metal halide bulb. Light illuminates a 5' x 5' area. Size: 20" x 19 1/2" x 8 1/2". 120 VAC; UL listed, with a 23' cord.